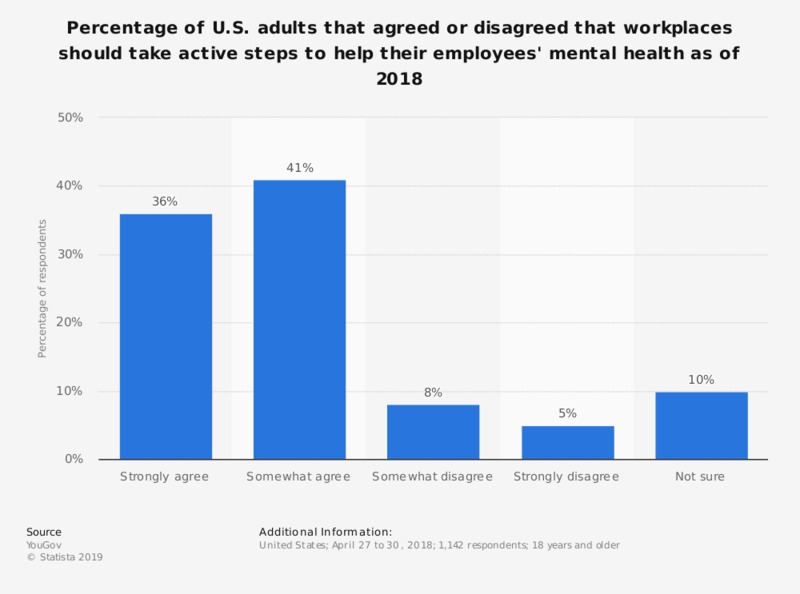 This statistic shows the percentage of U.S. adults that agreed, to various degrees, that workplaces should take active steps to help their employees' mental health as of 2018. According to the data, 41 percent of respondents somewhat agreed that workplaces should take active steps to help their employees' mental health. Original question: "To what extent do you agree or disagree with each of the following statements? Please select one option on each row." "Workplaces should take active steps to help their employees' mental health." What are the main areas of improvement with respect to diversity and inclusion policies in your company? What are the main focus areas of the diversity and inclusion policies applied by your company? In your opinion, what are the main advantages of introducing diversity and inclusion policies in the workplace? In your opinion, what are the main skills a manager should have to promote diversity and inclusion within a company?